Sally Thorne lives in Canberra, Australia and spends her days writing funding submissions and drafting contracts (yawn!) so it's not surprising that after hours she climbs into colorful fictional worlds of her own creation. Sally believes that romance readers are always searching for intensity in their next favorite book - and it isn't always so easy to find. Question: What inspired the story of 99 Percent Mine? Sally Thorne: I was inspired to write this story set in a house renovation, because my parents are renovating their old seaside shack, and it's a house that means a lot to our family. I like the brother's-best-friend romantic trope, so I decided to try a new take on it. 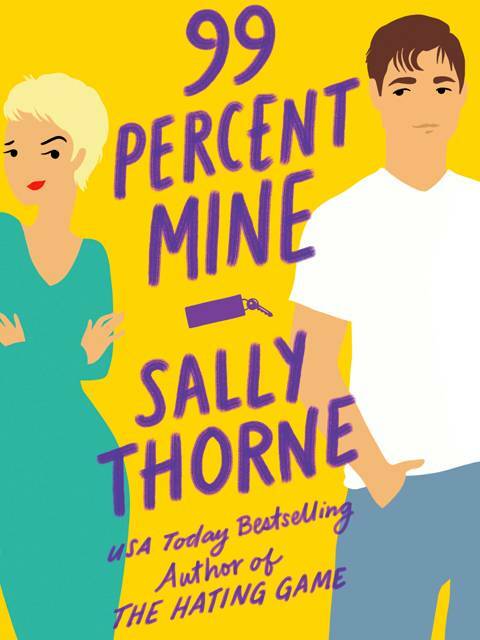 In 99 Percent Mine, Darcy Barrett has always completely adored her twin brother's best friend, Tom Valeska. She's travelled the world and can say with good authority that no man can match him. They all grew up together and she knows Tom's off limits- he's engaged to a beautiful girl with poreless skin, and his loyalty belongs to her brother. The twins don't share well. Darcy's always subsisted on having one percent of Tom's beautiful heart, and they've managed to ignore the electric, animal crackle of attraction that has always been between them. When Tom arrives to renovate the twin's tumble-down cottage, newly single for the first time in almost a decade, Darcy decides to maybe not get on the next plane out of there. Maybe she can shake him free of her twin brother's dominating hold and make him 99 percent hers. Sally Thorne: They are not based on anyone I know, but the Barrett twins are inspired a little by my mother and her twin brother. I grew up hearing all the hilarious pranks and situations the twins used to get up to as kids. Question: What is the best thing about creating a character like Darcy? Sally Thorne: I gave my story a second less-common twist; Darcy is a bad girl, and Tom is a good boy. I really liked this dynamic and how her leather-jacket toughness is juxtaposed against his sometimes naïve sweetness. In a lot of books, it's the brother telling his best friend to back off from his sister. In this story, it's Darcy who knows she has to keep her eyes and hands to herself. Darcy works in a bar and takes absolutely no crap from her gross customers- it was so liberating to write a female character who says her mind and asserts herself at every opportunity. I gave her a lot of characteristics that are often more associated with the male character: she's passionate, protective and possessive of Tom. She'd kill for him in a heartbeat. It is her lust and love for him that I think will be the hook for getting people into this story. Question: What do you enjoy most about writing for the romantic comedy genre? Sally Thorne: I like this genre because there's so much room for writing sweet, lovely, funny stories, that are still deeply meaningful and emotional. My goal is always to leave the reader feeling deeply satisfied and comforted. And hopefully ready to reread it from the beginning. Sally Thorne: I've signed a contract for two more books, so I'm working on my third book. The Hating Game is also being developed into a motion picture, with David Mirkin attached to direct (The Simpsons Movie, Romy and Michelle's High School Reunion). I hope to have lots of exciting developments to happen with that this year. I am visiting the US in April for a book tour, and signings in Melbourne and London. There's a lot going on for me in 2019, and I'm so grateful to everyone who reads my books.